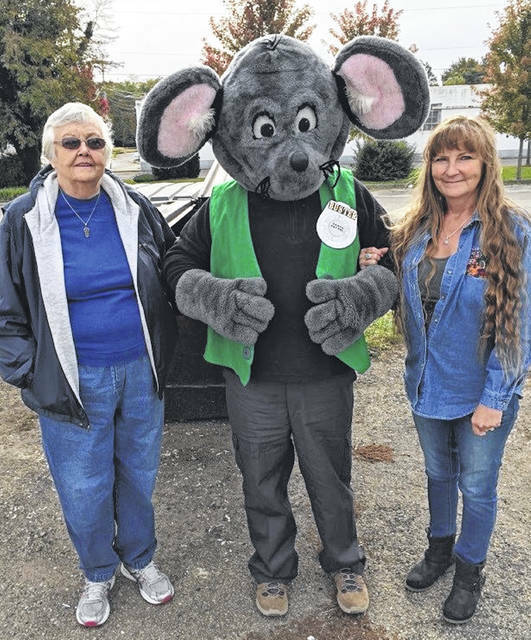 Buster the Mouse, from the Clinton County Solid Waste District, has caught the final winners in the 2018 Get Caught Recycling Campaign. Betty and Cindy Adams were caught putting the proper recyclables into the residential recycling drop-off containers located in Blanchester. For their efforts in practicing the 3Rs, Betty and Cindy received several recycled-content prizes, such as a hammock, backpack, Frisbee, boomerang, and other fun items. Although the 2018 Get Caught Recycling Campaign has come to an end, the Solid Waste District encourages all residents to practice good recycling year round. For a list of the local recycling drop-off locations and acceptable materials, visit the SWMD’s website at www.co.clinton.oh.us/recycling. Be on the lookout – you never know where Buster the Mouse might be lurking next!